Maxillomandibular advancement (sometimes called bimaxillary advancement or double jaw advancement) moves the upper (maxilla) and lower (mandible) jaws forward, and it effectively enlarges the airway in both the palate and tongue regions. Compared to other single procedures, it generally provides the greatest improvement in treating obstructive sleep apnea. Because the recovery is more prolonged than other procedures and because of a different set of potential risks, the procedure is generally performed in patients who have not obtained sufficient improvement in obstructive sleep apnea after other procedures. However, in some patients with jaw abnormalities it can be a first-line surgical treatment. The procedure is performed in the operating room under general anesthesia. Dr. Kezirian is not currently performing the procedure, but he has done so in the past with colleagues trained in oral and maxillofacial surgery. With this experience, Dr. Kezirian can speak clearly to the advantages and disadvantages of this treatment option for individual patients. All incisions are made inside the mouth, except perhaps for small incisions on the cheeks. The upper and lower jaws are freed with the use of thin saws and chisels, and they are advanced together, with placement of titanium plates and screws to hold the jaws in position. The surgery involves placement of large braces (arch bars) on the teeth that remain in place for 6 weeks; typically the jaws are not wired together, although rubber bands are usually placed to assist in maintaining a stable bite during the healing process. Patients are on a soft diet and avoid chewing for 4-6 weeks. Some patients may benefit from placement of a temporary tracheostomy to avoid problems that can occur with swelling after surgery. 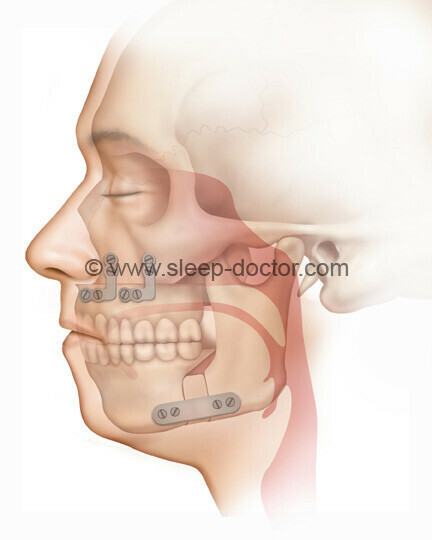 This procedure can be performed in patients who have abnormal jaw positions but who do not have OSA; in OSA patients, jaw advancement surgery is different, involving greater movements of the jaws, being technically more difficult for the surgeon, and having more risks and a more difficult recovery for patients. Although the procedure is designed to increase the space for breathing, the swelling that occurs after surgery can create substantial narrowing of the airway. In some cases, it may be necessary to leave the breathing tube in place for a period of time after the procedure or to perform a temporary tracheotomy to overcome these effects of swelling. As with many procedures, there will be minor bleeding during the procedure and the first few days following surgery. In addition, this procedure carries a risk of substantial bleeding from some blood vessels behind the upper jaw. Bleeding can occur in spite of the several precautions that are taken to avoid it. In some cases, this can require blood transfusion, with its associated risks of transmission of blood-borne disease such as HIV or Hepatitis (risk of contracting each disease estimated at 1 case per 2 million transfusions). The decision to administer a blood transfusion is based on a careful weighing of its benefits and risks. A major factor in preventing serious bleeding is to avoid the use of aspirin, NSAIDs (such as ibuprofen, Advil®, Motrin®, naproxen, or Aleve®), vitamin supplements, or herbal medications for at least three weeks before and after surgery. Strict control of blood pressure also decreases the risk of bleeding, and patients undergoing this procedure have close monitoring and control of blood pressure for the first 1-3 nights after surgery. Infection typically occurs only if the incisions inside the mouth come apart. To prevent this from happening, it may be helpful for patients to avoid talking unless absolutely necessary for three days following surgery. Patients also typically receive antibiotics at the time of surgery to reduce the chance of infection. Prior to surgery, all patients undergoing this procedure will have multiple X-rays taken to evaluate the bone and teeth of the upper and lower jaw. Only patients without abnormalities of this area are candidates for the procedure. In spite of all precautions, it is possible for the teeth to be injured during the procedure. In rare cases, this may require special dental care or a procedure such as an extraction or root canal. This procedure involves movements of the jaws, and the teeth with them. For most patients, the jaws are moved so that the way the teeth fit together (the bite) does not change. There are numerous factors involved, and several precautions are taken during the procedure and the healing process to maximize the chance that the jaws and teeth maintain their position to each other. However, there is a chance that the bite can change, either as a direct result of the procedure or over time. If this occurs and is uncomfortable or otherwise a problem, other procedures may be necessary, including dental procedures such as reshaping the surfaces of some of your teeth. This procedure involves cutting the upper and lower jaws, with dissection along nerves that provide sensation to the teeth. This is especially true for the lower teeth, where the bony cuts are right next to the canal for the nerve that supplies the lower teeth on each side. It is very common for patients to experience numbness of the lower teeth immediately after the procedure. Although this is not our goal, one advantage is that patients experience less pain while their teeth are numb. However, over time these nerves can re-grow, or other nerves in the area can grow to provide sensation to these teeth. During this period of the first 6-12 months following surgery, there can be tingling, sensitivity, or other unusual feelings in these teeth. The nerve recovery can be complete, but many patients have some degree of permanent numbness of the upper or lower teeth, with possible permanent tingling or sensitivity. The procedure involves dissection next to nerves that supply the sense of touch to the middle (cheeks) and lower (lower jaw and chin) portions of the face. It is very common for patients to experience some numbness of these areas immediately after the procedure due to swelling or stretching of the nerves. Again, although this is not our goal, one advantage is that patients experience less pain while their face is somewhat numb. However, over time these nerves can re-grow, or other nerves in the area can grow to provide sensation to these teeth. During this period of the first 6-12 months following surgery, there can be tingling, sensitivity, or other unusual feelings in these areas of the face. Only a small portion of patients have some degree of permanent numbness, and fortunately permanent tingling or sensitivity is rare. By moving the upper and lower jaw forward, the face has a change in appearance. The best way to describe this change is that the profile becomes “stronger.” The nose can also become slightly wider or have the tip turned upwards, although steps are taken to make the changes in appearance less dramatic. Many patients enjoy the minor changes in appearance, but the goal of surgery is to minimize the effects because this is not the purpose of the procedure. The procedure involves cutting the upper and lower jawbones, and they are stabilized in the advanced position with small titanium plates and screws. In spite of this stabilization, the jaws remain somewhat more fragile than they were prior to surgery. All patients should be careful to avoid significant trauma to the face after this procedure because there is an increased risk of fracture. Enlarging the throat improves breathing during sleep, but it also requires more motion of the tongue during swallowing. Particularly in the presence of swallowing that occurs immediately after surgery, some patients can experience difficulty with swallowing. This should temporary, as the nerves responsible for tongue movement are not in the area where the surgery is performed and should not be affected by this procedure. However, the changes could be permanent. Maxillomandibular advancement may not be effective in accomplishing the goals of surgery. Another procedure may be necessary to achieve the desired outcome. 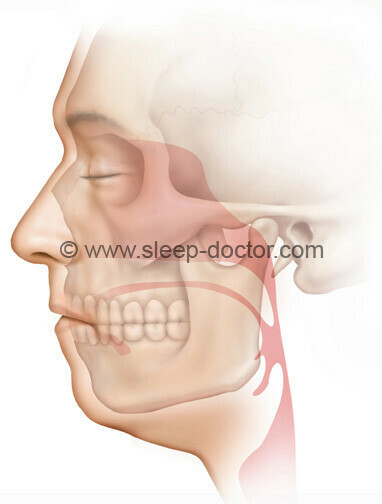 You should be prescribed pain medication after maxillomandibular advancement. Take this medication as you need it for pain control, and try not to let the pain increase until it becomes intolerable before you take the medication. If you prefer to avoid narcotics, you should feel free to use acetaminophen (Tylenol®). Ask your doctors whether you are cleared to take NSAIDs (such as ibuprofen, Advil®, Motrin®, naproxen, or Aleve®), but avoid aspirin, vitamin supplements, or herbal medications for at least two weeks because they can increase your risk of bleeding after surgery. Your pain will fluctuate as your numbness recovers, and your pain should be treated adequately. Due to a combination of pain and swelling that is to be expected, you will most likely have some trouble swallowing. This may be either a difficulty in getting food to go down your throat or having liquids “go down the wrong way” into your windpipe (trachea), with coughing as a result. During your recovery, be careful with eating and drinking. However, you will most likely only be able to tolerate a liquid diet for the first couple of weeks after surgery. It is helpful to drink liquids other than water (such as juices or Gatorade® and, especially, milk shakes or Ensure®) to provide energy and protein during the recovery period. After this period of time, you should transition to soft solid foods such as eggs or yogurt. We will want you on a soft (all solid food placed in a blender) diet for the first six weeks after surgery. Holding ice in the mouth while they melt and cool the surgical area can help with pain control. Doing this for the first 2-3 days after surgery is somewhat similar to applying ice to a sprained ankle. It is one of the safest ways to reduce pain and can make the healing process easier. You will be prescribed an antibiotic to take for several days. This can be useful for preventing infection and decreasing swelling. Take the antibiotics as directed. If you develop a rash or diarrhea (possible risks of antibiotics and other medications), stop the antibiotics and contact your doctor immediately. Nasal saline (salt water for the nose) serves two purposes. It gently washes away all loose debris such as dried blood to keep the nose clean during the healing process, and it also accelerates healing by maintaining a moist environment in the nose. A decongestant decreases the amount of swelling in the nose and can keep the nasal passages open during the healing phase. Because these sprays cannot be used for more than a few days without causing their own set of problems, we will use them while you are in the hospital regularly and then have you use them only as needed to control any bleeding from the nose. In case of bleeding, sit down and spray two sprays of this medication in the side that is bleeding. Repeat the sprays up to five times (two sprays at a time) every five minutes until the bleeding stops or slows substantially. Pinching your nose may not be helpful because the bleeding may be coming from areas farther back in the nose. Tilt your head forward slightly so that the blood does not run down the back of your throat, although try to let the medication spray stay in your nose. At a minimum, patients should walk at least three times a day starting the day after surgery. Walking and spending more time out of bed (walking or in a chair) rather than in bed are helpful because they reduce the risks of developing pneumonia or blood clots in the legs. However, patients should avoid strenuous activity because it typically raises heart rate and blood pressure. For this reason, it can increase swelling or cause bleeding to start. Elevating your head during sleep decreases blood flow to the head and neck regions. Therefore, it decreases swelling and the associated pain. Elevating the head during sleep may also improve breathing patterns in other ways. Therefore, we recommend elevating your head during sleep at 45 degrees for at least seven days following the procedure. NOTIFY YOUR SURGEON IMMEDIATELY IF YOU HAVE ANY TROUBLE BREATHING OR IF ANY BLEEDING DEVELOPS ONCE YOU ARE DISCHARGED FROM THE HOSPITAL.